The iPhone XS is easily the best phone Apple has made. When it comes to its camera capabilities, it has had modest upgrades. While there isn't a whole lot of change, the inclusion of a new sensor really enhances the images taken. Couple this with a better screen, bag-loads of storage space and it being one of the most powerful smartphones around, then this is a brilliant camera phone package. The iPhone XS camera had a big part to play at this year’s iPhone launch – and for good reason. Apple has been making great strides in the camera space with its smartphones, creating a massive marketing push with the Shot on iPhone campaign and there’s even a How To Shoot on iPhone dedicated section on its official website. The problem is, Apple has some big competition in this space. Huawei has been pushing its camera technology in the Huawei P20 Pro – offering effective image stabilisation, superb detail and decent bokeh effects from its triple lens setup (in partnership with Leica). Couple this with its boast that it has a 40MP sensor measuring 1/1.7 inches (compared to the iPhone X’s 1/2.9 inches) and Apple has a little work to keep up with the Joneses – so how does the iPhones XS camera compare? Both the iPhone XS and iPhone XS Max cameras are built around what seems to be the same hardware as the iPhone X, but the setup is somewhat different. There’s a 12MP camera on the phone, which is now backed by a bigger sensor than that seen in the iPhone X. Here the sensor measures 1.4µm, while the iPhone X’s only managed 1.22µm. What that means is that the camera should be able to stand stronger when the conditions aren’t the best for shooting. On board, there are two lenses: a six-element, wide-angle f/1.8 lens, coupled with an f/2.4 telephoto optic in front. Optical image stabilisation is also present and correct and the True Tone flash that impressed many on the iPhone X is back with a vengeance, with greater powers to give a more accurate color reproduction. Flip to the front of the phone and Apple has tinkered under the bonnet with the front TrueDepth camera. Speed is utterly of the essence here, with a new 7MP sensor that’s now ‘double the speed’ of its predecessor – this has been given a f/2.2 lens. Features that run alongside this include the dot projector and IR camera that Apple uses for Face ID and takes advantage of for a number of new photo processing upgrades. All of this hardware is powered by the A12 Bionic chip, which – working with the phone’s image signal processor (ISP) – boasts some eye-opening features. For a start, this power bump means the iPhone can make a trillion operations per photo (Apple’s boast, not something we counted in our tests. We’re diligent, but not to that level). Boil this down and it means that red eye should be a thing of the past, something that never appeared in our tests, and it offers much greater control in post-production. Smart HDR mode did well blurring the right areas in this shot. Portrait didn't detect the top of the stake of this burger but it's still a decent shot. The two main features to note: Smart HDR, which combines faster sensors and better smarts from Apple’s new A12 Bionic chip for a more rounded and impressive picture, and a new Depth Control option (where you can manually adjust the aperture from f/1.4 to f/16 after the shot is taken to bring greater blur to the background of a Portrait mode photo). On paper, all of this sounds great, but how did it test in the field? The camera on the iPhone XS and iPhone XS Mac is easy to use. Settings, surprising for a smartphone, are kept to a minimum which makes it fuss free to shooting images. It's easy to flip through the two 'zoom' levels by tapping the '1x' icon that can be found on the screen. One of the big new features can be found in portrait mode - once you take a portrait shot, you can go to the phone gallery, tap edit and adjust the background blur with the slider. Specs-wise, there is very little difference between the iPhone XS and iPhone X – the f-stops are the same, the optical zoom (2x) and digital zooms (10x) are the same, as is the dual optical image stabilisation. The (literally) biggest change is to the sensor size. Going from 1.22µm to 1.4µm is significant and having this backed by the A12 Bionic chip means the software has gone through a number of improvements. The depth of the pixels has also been improved, meaning you’ve got theoretically faster autofocus, although we didn’t notice much of an improvement there in our tests. Given HDR is the big buzzword of the moment (and for good reason), it’s great to see Apple enhance this feature with the iPhone XS. Where we saw Auto HDR on the iPhone X, Smart HDR sees Apple make use of its lack of shutter lag and use a ‘four-frame buffer’ when you take images of a moving image. Shot on the iPhone XS, there's a huge amount of detail in the leaves. The idea being that this extra time allows for enhanced detail, with the phone taking its pic of the best bit of the photo in each frame, and a longer exposure. It also uses the Neural Engine of the new A12 chip to work out better what’s being seen by the camera and alter the settings accordingly. The result is Apple’s retaliation against the intelligent shot processing that other phones in its category (namely the Google Pixel 2, the Huawei P20 Pro and the Samsung Galaxy S9) offer and by and large, it works well. In our test, in day-to-day conditions, the shots taken were decent. Images we superbly detailed and oozing the colour and sharpness we have all come to expect when you add HDR into the mix. Compared to the iPhone X, images have a touch more color and saturation, and it resembles a good hybrid of the Pixel 2 XL and the Samsung Galaxy Note 9. Because of the XS' processing power, we noticed enhancements in darker areas and the phone balanced highlights, lowlights and detail well. Depth Control is an interesting one for Apple. In the keynote, it claimed that the adjustment of depth of field (from f/1.4 to f/1.6) was something that hasn’t been possible in photography of any type of camera. But it’s a feature we have seen on the Samsung Galaxy S9 and companies such as Lytro have made it a big feature in the past – albeit in slightly different guises (Apple's USP, it claims, is the ability to change the aperture) and perhaps not offering as much manual control that's on display here. We found the post-shot blurring to really be effective and makes the image look better – it worked particularly well if there’s strong light in the background of the shot. It isn't perfect, though. While the face is the big focal point for these features, on the face there was a little blurring of things like clothes and hair which didn't fit quite right with the image. The manual controls are decent, though. When you use the slider to tone up or tone down your image with blur a small dot appears – this is where Apple believe the sweet spot is – and it's a good starting place for the manual controls. The same effect can be used on the front-facing camera too, despite only having a single sensor - it uses a combination of the other sensors locked in at the front to establish depth and blurs out the background as well. It’s not as sharp as the rear camera, but that’s understandable given it’s using software to work out the depth. As previously mentioned, the iPhone XS is pretty capable of lower-light shooting in mixed conditions, based on our early testing. When light is very low, it can struggle a little compared to the competition. A bit more light and detail and colour is nicely picked up. In our early tests, there isn't a huge amount of difference in camera quality on the iPhone X and the iPhone XS. But the changes made really do enhance the quality of the images you are taking. The big point here, though, is that the iPhone X is no longer available from Apple so if you have yet to jump to an X-branded iPhone then you will find a lot to love here. There's a sizeable 5.8-inch OLED panel (2436 x 1125px) with a 458ppi pixel density, which works fantastically well for both viewing images and to set shots up from. Colours have been boosted thanks to improvements of the dynamic range – with Apple believing it has the ‘best colour accuracy in the industry’. Battery life is a little better than the iPhone X and storage goes all the way up to 512GB, which is great for image storage. We still need more time to get the most out of the iPhone XS' camera, but it is great to see a phone company once again push the boundaries of what is possible with smartphone photography – both from a sensor and software point of view. 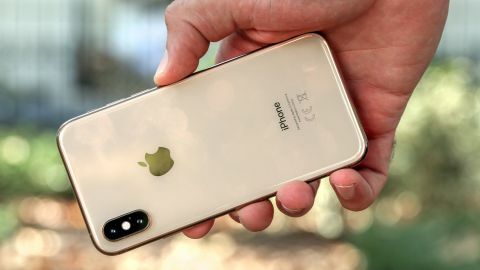 To read more about the iPhone XS, head to TechRadar for their fantastic in-depth review.